Gamers patiently waiting for the release of the new PlayStation 4 exclusive Bloodborne game that will finally be launching across Europe on March 25th 2015. 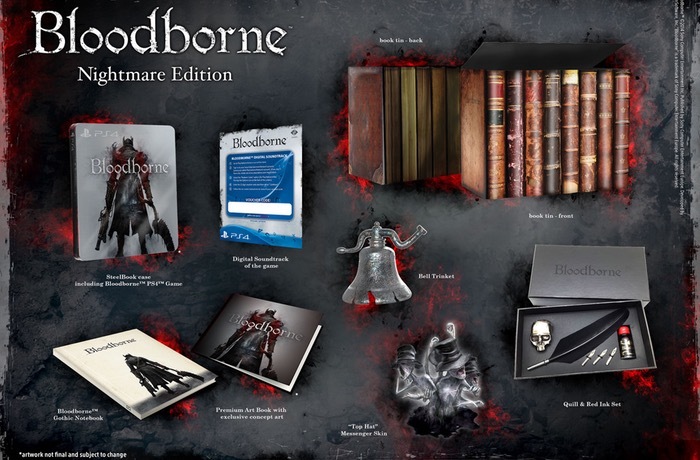 Will be pleased to know that Sony has released details of what you can expect to find in the Bloodborne Collector’s Edition that will be priced at €80 when the game launches and is now available to pre-order. ‘Fedora’ Messenger Skin : Messengers deliver unique messages left by fellow journeymen to aid you on your quest, or fool you into making a fatal mistake. This Messenger is wearing a Fedora Hat and appears to you and other users when you leave a message in-game. ‘Bandages’ Messenger Skin : Messengers deliver unique messages left by fellow journeymen to aid you on your quest, or fool you into making a fatal mistake. This Messenger is wearing Bandages over their heads and appears to you and other users when you leave a message in-game. Bloodborne ‘Saw Cleaver’ SteelBook : The Bloodborne SteelBook features unique artwork by From Software on the inside and out, and is exclusively available as a pre-order incentive. For more information on the new Bloodborne Collector’s Edition jump over to the PS Blog website for details via the link below.